The group-wide application phase for the second batch of the RBI Elevator Lab will start on May 1st. Startups can apply in six categories. Topics like Blockchain were newly added. “We are looking for startups that can create value together with RBI. We want to test their solutions, develop them further and apply them in our markets,” says Max Schausberger. He is Program Lead at RBI Elevator Lab, the FinTech Accelerator of Raiffeisen Bank International. The Elevator Lab runs as a “Virtual Program” for most of the time. The startups don’t have to be constantly present throughout the duration of 4 months. “Once a month we have three intense days here in Vienna,” explains Mister Schausberger. Then the startups will work directly with the relevant RBI business units on joint pilot projects. “They have the chance to demonstrate that cooperation is worthwhile”. In addition external experts from a wide range of fields will provide mentoring sessions to the startups. The applicant startups do not necessarily have to be FinTechs. “Of course, this is the area closest to banks. It is becoming more relevant for us to look beyond the boundaries of our industry though. So, I can only encourage any startup that sees a chance for a beneficial cooperation to apply to the RBI Elevator Lab”, says the Program Lead. Thereby he emphasizes the potential in the large market of RBI. 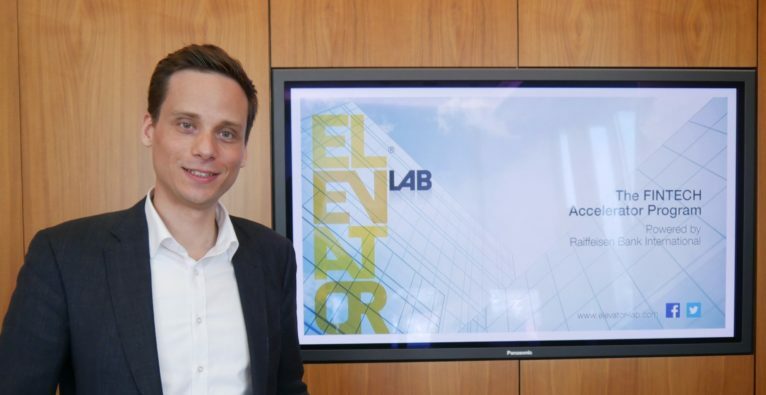 The Austrian bank has subsidiary banks throughout the entire CEE region – eight of which have their own regional challenges as part of the Elevator Lab program. The regional winners will receive a “wildcard” for the group-wide program. “The growth forecasts for these markets are well above the European average. This is a huge opportunity for our cooperation projects with the startups,” explains Schausberger. Advanced Analytics, including Artificial Intelligence, predictive analytics, client and trading data analytics, client interaction analytics as well as augmented credit scoring and SME lending. Corporate Banking, including blockchain-based trade finance solutions, corporate prizing solutions, eDocument and optical character recognition as well as robotic FX trading advice. Investing & TradingTech, including blockchain-based investment banking solutions, smart contract certificates, automated document generation and hybrid or digital advice. New Branch Experience, including automated branch digitization, augmented or virtual reality, PoS solutions, remote advice and voice banking. Open Banking, including third party provider products and services, fund brokerage platforms and corporate multibank data aggregation. RegTech, including cyber security, blockchain-based AML, KYC, customer authentication and digital ID solutions, data protection and management as well as text mining. Startups can apply until June 24th 2018. After a pre-selection of the semi-finalists, there will be Skype pitches from September 5th to 7th to determine the finalists. The Application for the Raiffeisen Bank International AG Elevator Lab is open again! Here's what you should know about the second batch of the FinTech accelerator.